There is one thing that has always been important when it comes to motocross. That is tire selection. A poor quality tire will wear quickly, weigh too much, and you will likely discover that it is hard to find traction with. The thing about tire selection is there are names you can trust, and then names that scream cheap knock-off garbage. Well Bridgestone dirt bike tires can be trusted. The roots of Bridgestone in the tire industry are deep. They started out in 1931 making tires for passenger cars. As time went on Bridgestone stood out as a true leader in the advancements of tire technology. How does this help you with your motocross tire purchase? It does not necessarily help you, however, it proves that the company is dedicated to making high quality tires. Otherwise, they simply wouldn’t have survived. The Battlecross X10 is an all-out sand and mud tire. It has been almost completely redesigned compared to its predecessor and offers better properties all around. Let’s first talk about its great deformation. This may sound bad but simply put, it is how the rubber adjusts to the terrain. As the blocks deform, they create more biting edges in the sand and mud. More biting edge = more traction. No complaints. The benefits don’t end there though. As the tire lugs flex, it also make it harder for the lugs to be jammed with dirt. Essentially this gives the tire self-cleaning properties which aids with traction, weight savings, and pretty much everything else you want in a tire. It is evident when riding that this sand tire is a lot easier to control than the M101/M102. It just feels like the rear tracks better. 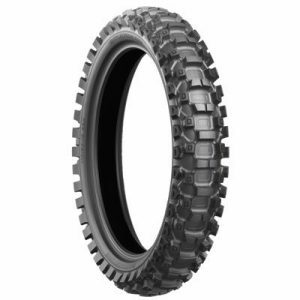 Overall the X10 is a great sand and deep mud tire that will leave you feeling ready to hit the track. 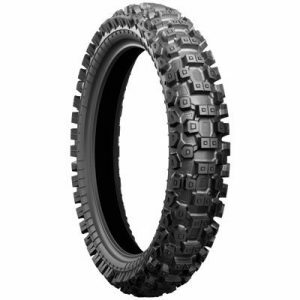 If you’re looking for a soft terrain tire, then this is the Bridgestone you should be looking at. The X20 thrives in soft, loamy environments. However, saying that, it won’t leave you stranded on an intermediate terrain track either. This tire is ready to help you push your boundaries. It makes use of castle block technology which I will describe more about in the technology section but this essentially means more grip for you, the rider. Personally, I have always been a fan of Bridgestone dirt bike tires and this tire truly shines when the ground isn’t hard. For muddy days this is quickly becoming a popular choice and that is no surprise! 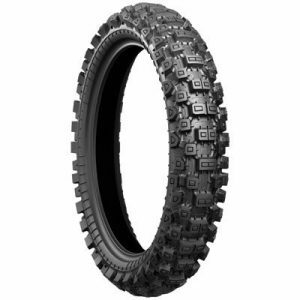 This is my favorite Bridgestone dirt bike tire! I would describe the X30 as the do it all tire. It is at home on intermediate to soft terrain but won’t be caught slipping on harder terrain either. This is the type of tire that you can put on your bike, and then go and ride wherever you like without too many issues. It uses castle block tech as well as anti-degradation fins. Don’t let it’s “do it all” capabilities fool you into thinking it is lesser on intermediate terrain as a result. It is still an intermediate tire, and it is one of my personal top picks. Ask other riders who use this tire what they think and the answer will likely be positive. Here is the final tire in the Bridgestone Battlecross line up. It is for intermediate to hard terrain. As you would have guessed the knobs are spaced slightly closer together than on the X30 tire. This is so you can get that extra surface area of contact for a ton of traction. Like the X30, the X40 also makes use of the trademarked castle block and anti-degradation fin technologies. 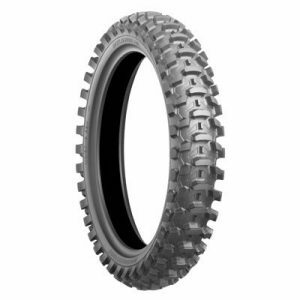 This tire is definitely best suited to hard terrains, however, if you have the occasional softer trail that you ride, it will still work well for you. If the riding you do is 50% soft terrain and 50% hard terrain, I would recommend the X30 though. This is because hard terrain tires typically get clogged with mud much easier than tires with wider spacing between lugs. You probably noticed that above I mentioned two different technologies a couple of times. Well these are the two real standout features of the Bridgestone Battlecross series. I thought is important that I explain them so that you fully understand the benefits they offer. The best way to describe this is as a lug within a lug. It creates more biting edges which helps with extremely slippery terrain such as when there is loose dirt on top of hard packed dirt. Not only that but the smaller block will compress before the bigger block and then the bigger block will take the rest of the impact and sort of spread the load. You can find castle block tech on the X20, X30, and X40 rear tires. This is a fancy name for cooling fins. Fun fact of the day: rubber and heat do not mix well. Typically tires on harder surfaces heat up more quickly than tires on softer terrain. This heat can cause pre-mature tire wear. This is why Bridgestone decided to put cooling fins on the sidewalls of the X30 and X40 rear tires. It has proven to make the tires last longer and maintain their shape better than before. Unfortunately Battlecross tires are not available for mini bikes. Instead Bridgestone offers totally different options. I will not get into too much detail here. However, I wanted to show them off just so you guys know what is out there. These are the medium terrain front and rear mini bike tires. Since there is not hard packed mini bike tires from Bridgestone, I recommend using these for medium to hard terrain. The technology on these tires is nothing crazy but a lot of mini bike riders love them so Bridgestone must be doing something right here! These tires are designed for medium to soft terrain. If the track is loamy or sandy, these are the best mini bike motocross tires by Bridgestone. Bridgestone makes a lot of tires! For the sake of Motocross Advice, we have already considered the best tires in my opinion. However, I want to let you guys know that there are still more options! Here are a few of the other tires available. This will be most helpful to trail riders, duel sport riders, and enduro athletes. Gritty- The Gritty tire series is designed for Enduro Athletes. It makes use of motocross compounds with tread spacing that will work well in diverse conditions. Some Enduro athletes prefer to use tires from the Battlecross series but this is up to personal preference. Trail Wing- Trail wing tires are great for people who are out riding for the fun of it. They are street legal so that riding along the road between sections of trail will be no problem. These tires offer good grip on intermediate to hard terrain and will hold up for quite a while. Bridgestone dirt bike tires come with a perfect selection and serves every professional rider needs. 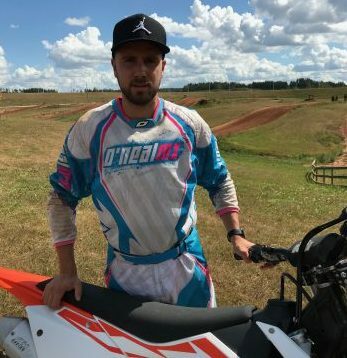 They make some that are top level such as the Battlecross series, and then they make some that are designed for more leisurely riding such as the Trail Wing series. The thing is, all of them are designed to perform well. There is no garbage motocross Bridgestone in my opinion. However, I can tell you what my personal favorite is. The X30! It is such a good tire. I just love it. Hopefully this article helped you decide if Bridgestone dirt bike tires are right choice for you!